Government workers protest the government shutdown during a demonstration in the Federal Building Plaza on January 10, 2019 in Chicago, Illinois. Although 800,000 federal workers have stopped receiving a paycheck during the longest government shutdown in history, their bills have not stopped piling up. Some workers, such as Transportation Security Administration (TSA) agents and some members of the military, are working without pay. 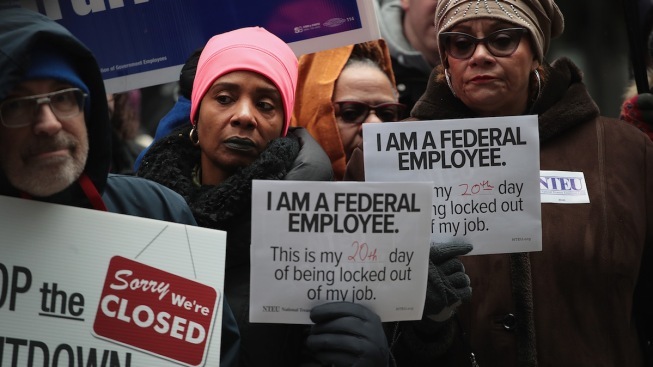 Many federal workers are worried about how the shutdown will affect their credit score. That's because jobs at some government agencies, such as the Federal Aviation Administration, Federal Bureau of Investigation and Department of Defense, among others, require that employees maintain proper credit and don't have debt in collections. "Debt poses vulnerability to potential bribery and even potential collaboration with a foreign adversary," U.S. Sen. Richard Blumenthal said during a Monday news conference with federal workers at Bradley International Airport in Connecticut. Blumenthal highlighted the ramifications of working without pay during the furlough. Experts say informing creditors of the situation is the first step to protect one's credit score. "If I'm an employee affected by the shutdown, one of first things I am going to do is call my lender or creditor and say – I'm in trouble. I need help. What can you do to help me? What can we do together to mitigate the shutdown impact on me and my family?" said Eric J. Ellman, Consumer Data Industry Association senior vice president of public policy and legal affairs. On Jan. 2, the CDIA issued forbearance guidance to lenders and creditors on how best to report to the credit bureaus — Equifax, TransUnion and Experian — so the forbearance has no negative impact on the consumer. A TransUnion spokesperson said that contact information for lenders can be found on your most recent bill or credit report. TransUnion was also recommending that lenders use a code they've provided "that will help give people a break on their credit during this difficult time." "Though we can’t instruct financial institutions on how to help consumers, our code recommendation is nearly universally followed," the spokesperson added. Some national companies are offering debt relief to impacted workers. The U.S. Office of Personnel Management tweeted a link to sample letters that workers may use to write to their creditors and seek help. Here's an overview of some companies offering relief to workers impacted by the shutdown. This list includes companies compiled by USA Today (Read their full article here). Federal workers impacted by the government shutdown are eligible for unemployment benefits, according to the Office of Personnel Management. Obtain information on benefits here. AT&T is helping workers imapcted by the shutdown by offering flexible payments. Details here. Sprint is assisting customers by providing short-term payment solutions. Customers should call 888-211-4727 or chat with a representative online. T-Mobile is providing flexible payment support options to customers, including deferring payments or spreading payments out over time. Contact 611 or 877-746-0909. Verizon launched a Promise to Pay program, which allows customers to set a future payment date via the app or call 866-266-1445. Wells Fargo will work with "individuals and business banking customers whose income is disrupted as a result of the shutdown. Customers should call 1-800-TO-WELLS, or the number on their credit card, debit card or statement for assistance, or visit any Wells Fargo branch." Contact information here. U.S. Bank has launched a low-rate and quick loan for their customers needing assistance. Details here. The Federal Credit Union is waiving fees for early withdrawls and other benefits outlined here. The Congressional Federal Credit Union is offering multiple solutions for those impacted, scuh as a relife line of credit, personal loans, credit increases and deferment on existing loans. More information here. Navy Federal Credit Union is offering loan programs for qualified federal workers. Information about how to register can be found here. Bank of America is providing client assistance tailored to customer needs. Call 844-219-0690. Chase is offering hardship programs and encourages customers to call 888-356-0023 to explore their options. Some of the benefits being offered include automatically waiving or refunding overdraft and montly service fees. Citibank offers a range of assistance to customers experiencing financial hardship. Customers can call 800-950-5114 for credit card assistance and 800-283-7918 for mortgage assistance. Discover says it's available to assist government employees affected by the shutdown. Call 1-800-DISCOVER. SoFi is offering payment forbearance during the government shutdown. Customers may call 844-975-7634 for qualifying information.